I've seen a number of presentations recently where companies are putting up SPECvirt data and drawing some interesting conclusions. I am not a SPECvirt expert but it seems to me that they're not comparing / contrasting the data properly. Here's an example. Note: There is absolutely nothing wrong with this image. The interpretation by some people is what appears to be wrong. I've heard a number of speakers (who are *not* associated with redhat by the way) implying that the data shows KVM being substantially better than vmware esx. So what am I saying here? From what I understand the above chart is simply a chart of specvirt numbers. It cannot be used as a comparison between esx and kvm as the underlying hardware is different. 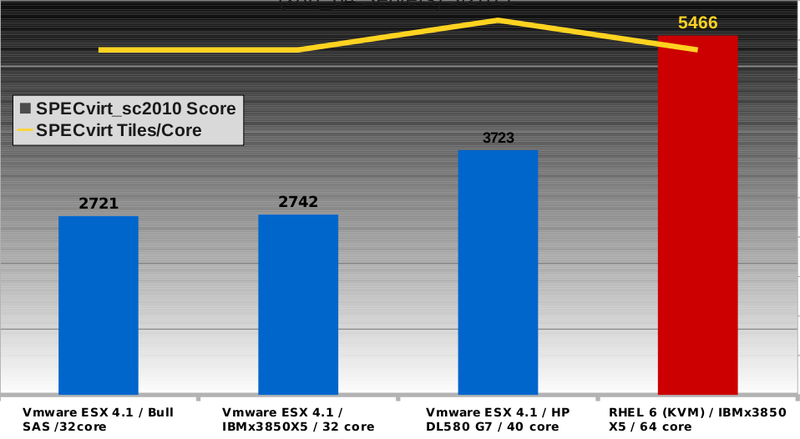 I think we can safely say that the performance is probably the same, maybe an edge to KVM. I think we're likely to see bigger differences within platforms when say for example in KVM you use vhost_net drivers, remove non-required h/w from the guests, huge pages, pci pass-through etc etc to optimize the platform performance - that could easily lead to a 10% performance change. SPECvirt is really good and is a fantastic tool for determining relative performance impacts of tuning actions within a h/w platform. Please don't abuse the numbers.